The Department of Local Affairs collected crowd-sourced information about a site/city from the people who pass through that site regularly. The goal of the project was to reshape our sense of a site based on an ongoing everyday (for other examples of this, see Yelp or Couchsurfing), rather than through outdated historical information and gentrification/advertisement’s highest hopes. The project also served a very real function: assisting visitors to a place with useful, practical information, as well as with more poetic interpretations of what the city is, or means. In the Summer of 2014 Chloë Bass completed a residency in Omaha, NE at the Bemis Center for Contemporary Arts where she worked on developing The Department of Local Affairs. 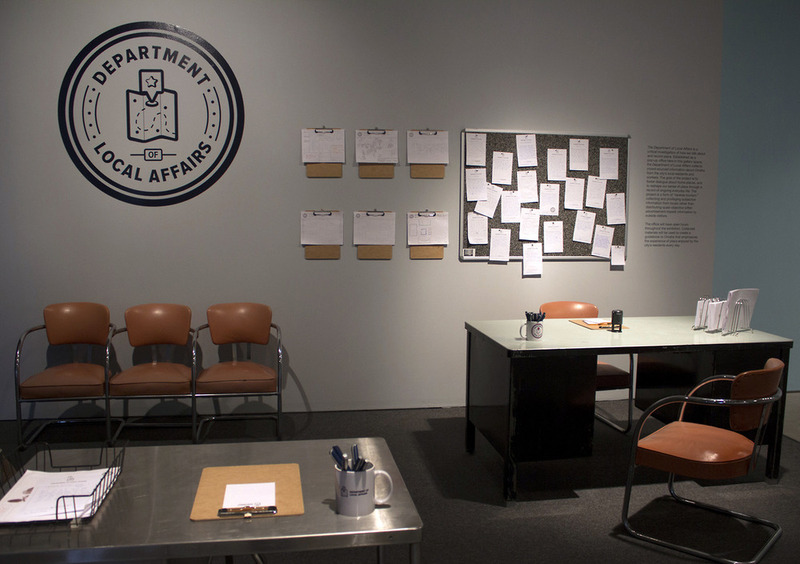 On August 5th The Department of Local Affairs opened in exhibit form at the Bemis Center where it was embedded as part of the Urban Design Lab Program. You can check out her dispatches from Omaha on Hyperallergic. The Department of Local Affairs, with the support of the Laundromat Project was located in Bed-Stuy, Brooklyn. The project resulted in both a guide to that neighborhood, and in the development of Department of Local Affairs process that could be applied to running the project in any city. Design a pamphlet. Blank pamphlets will be made available for anyone to fill in. Make a map. Graph paper will be provided for people to make maps between locations they consider to be important. Leave a review. Add your own opinion to materials that other people have created before you, providing additional information and/or feedback about the place reference. Offer advice. Things that people should know about the social “site” of your city? This office installation served as a space where New Yorkers could share basic, everyday information about the city (or their own particular neighborhood), connecting people at an intimate, yet playful level. Each person who visited The Department of Local Affairs was invited to input information about their neighborhood using a variety of different, creative formats. Chloë Bass (b. 1984) is an artist and public practitioner. Chloë has received commissions from the Culture Project’s Women Center Stage Festival, the Bushwick Starr’s Bushwhack Festival, and 3rd Ward’s Moviehouse. She has received residencies from POGON (Zagreb, Croatia) and D21 Kunstraum/5533 art space (Leipzig, Germany and Istanbul, Turkey). Recent work has been seen at Momenta Art, Künstlerhaus Stuttgart, Flux Factory, Kunstkammer AZB (Zurich), Akademie Schloss Solitude, Exit Art, Contemporary Art Institute of Detroit, ITINERANT Performance Festival, Glasshouse, Panoply Performance Laboratory, and Agape Enterprise, among others. Selected profiles of her work have appeared in BOMB, Entorno, ArtInfo, Art Observed, and Hyperallergic. She is a 2011 & 2012 Rema Hort Mann Foundation Individual Artist Grant Nominee. From 2007 – 2011, Chloë served as the co-lead organizer for Arts in Bushwick, which produces Bushwick Open Studios, BETA Spaces, and Armory Arts Week performance festival SITE Fest, which she founded. She has guest lectured at Parsons School of Design, Sotheby’s Institute, the Polytechnic University of Puerto Rico, and Brooklyn College CUNY. She holds a BA in Theater Studies from Yale University, and an MFA in Performance and Interactive Media Arts (PIMA) from Brooklyn College.